In late February, during my son’s winter break, we decided to head to Philly for the weekend. It was a great call. Not only is Philadelphia an easy drive from Brooklyn, not only had it been way too long since I’d had DiNic’s ridiculous roast pork and broccoli rabe sandwich, not only had we long wanted to take the kids to the hyped (deservedly, it turns out!) Please Touch Children’s Museum, but the city of Brotherly Love was also the site of my first date with Mom and Buried! Needless to say, this visit wasn’t exactly the same as the one that had launched our relationship some 13+ years ago. Nothing is the same once you have kids. Pre-kids, we would have gotten a hotel room with one (huge) bed, we would have gone to dinner at fancy places, and we would have stayed out late bar-hopping. This time around, we got two double beds to make co-sleeping easier, we only ate at places that served chicken fingers, and instead of drunkenly stumbling around looking for a late-night cheese-steak, we quietly shared drinks in the hotel hallway while we waited for the kids to fall asleep. We know from (miserable) experience that our kids – the toddler in particular – can sense our presence. So long as The Hammer knows we’re nearby, he refuses to sleep. So we put him in the Pack ‘n Play, shoved it into the bathroom, kissed both kids good night, and crept outside into the hall to wait for the storm to pass. And you’re damn right we brought cocktails! It was the ultimate parenting travel hack! Mom and Buried and I deserve to have some fun and a moment or two of relaxation just as much as our kids do. All parents deserve that! And nothing ruins “fun” and “relaxation” like screaming children who’ve been woken up by the popping of a champagne bottle. So we improvised. And it was a blast! During our hallway happy hour, we greeted with glee the occasional passerby, the younger ones surely wondering what the hell we were doing sitting on the carpet with a bottle of champagne and a six-pack, the older ones probably implicitly understanding that we were doing whatever it took to survive traveling with small children. Because doing whatever it takes is what parents do. 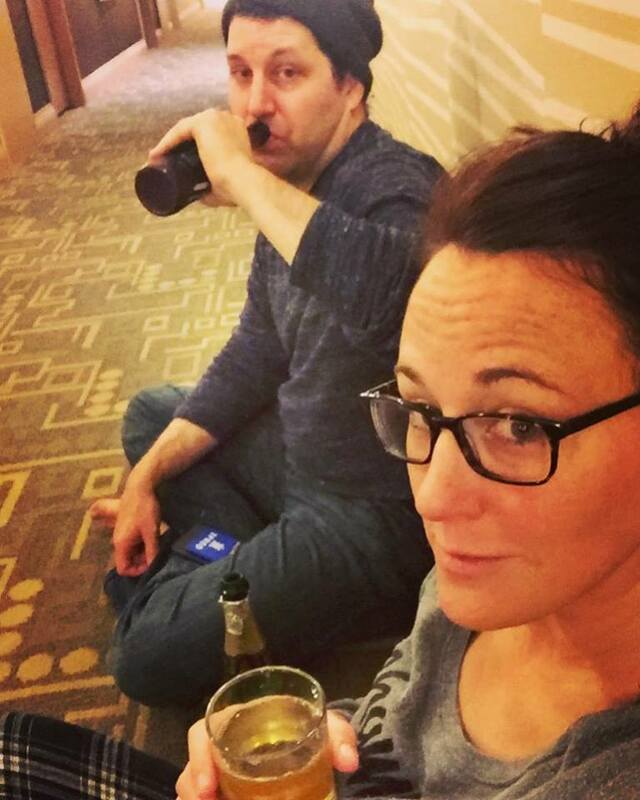 Not by choice – no one would *choose* to have happy hour in a hotel hallway – but because we often HAVE NO CHOICE! I can’t call that brief trip out-of-town a vacation – nothing you do with kids is a vacation – but the visit to Philadelphia wasn’t just for my hyper, talkative 7-year-old and his cheerfully reckless little brother. No, it was for us too. And we were going to take advantage of it. So we shut the door, got comfy on the well-trafficked hallway rug, and clinked glasses as quietly as possible lest we accidentally wake the beasts. Once they were snoring, we popped back into the room, quietly watched Netflix on the laptop, and finished our drinks. The kids didn’t wake up, we managed to finish a movie, catch a buzz AND fall asleep early-ish (THE TRIPLE CROWN! ), and everyone survived. Except maybe the hallway carpet. Sorry about the spill, Center City Doubletree! This post originally appeared on Facebook.